Home News Man Bags Five Years Imprisonment For Sitting On Tor Tiv's Chair! 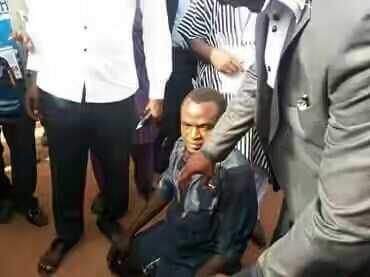 Man Bags Five Years Imprisonment For Sitting On Tor Tiv's Chair! One Stephen Nyitse, has bagged a 5-year jail sentence for sitting on the throne of the leader of the Tiv tribe, during the new Tor Tiv's installation last Saturday. Police State, was found guilty of trespass and impersonating the new Tor Tiv, V, Orchivirigh Professor James Ayatse. "His action is a disgrace to the Tiv nation for which he deserved no mercy, and hence the punishment to serve as deterrent to others" Justice Chaha said.